Under the perpetual system the Inventory account is constantly (or perpetually) changing. When a retailer purchases merchandise, the retailer debits its Inventory account for the cost; when the retailer sells the merchandise to its customers its Inventory account is credited and its Cost of Goods Sold account is debited for the cost of the goods sold. Rather than staying dormant as it does with the periodic method, the Inventory account balance is continuously updated. With perpetual FIFO, the first (or oldest) costs are the first moved from the Inventory account and debited to the Cost of Goods Sold account. The end result under perpetual FIFO is the same as under periodic FIFO. 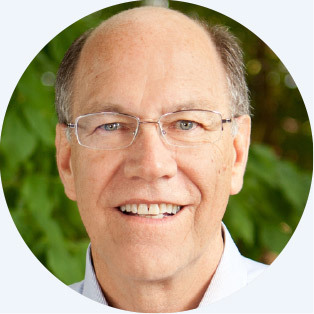 In other words, the first costs are the same whether you move the cost out of inventory with each sale (perpetual) or whether you wait until the year is over (periodic). Under the perpetual system the Inventory account is constantly (or perpetually) changing. 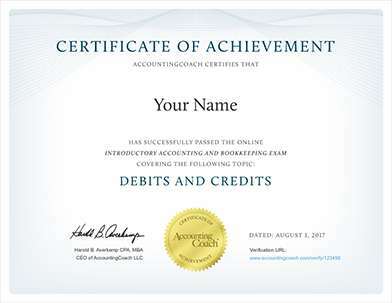 When a retailer purchases merchandise, the retailer debits its Inventory account for the cost of the merchandise. When the retailer sells the merchandise to its customers, the retailer credits its Inventory account for the cost of the goods that were sold and debits its Cost of Goods Sold account for their cost. Rather than staying dormant as it does with the periodic method, the Inventory account balance is continuously updated. With perpetual LIFO, the last costs available at the time of the sale are the first to be removed from the Inventory account and debited to the Cost of Goods Sold account. Since this is the perpetual system we cannot wait until the end of the year to determine the last cost—an entry must be recorded at the time of the sale in order to reduce the Inventory account and to increase the Cost of Goods Sold account. Let's assume that after Corner Shelf makes its second purchase in June 2018, Corner Shelf sells one book. This means the last cost at the time of the sale was $89. Under perpetual LIFO the following entry must be made at the time of the sale: $89 will be credited to Inventory and $89 will be debited to Cost of Goods Sold. 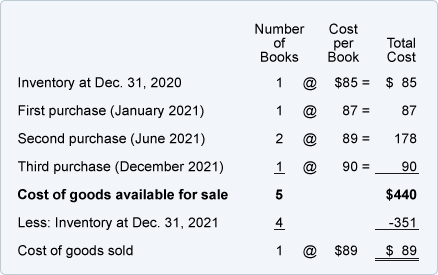 If that was the only book sold during the year, at the end of the year the Cost of Goods Sold account will have a balance of $89 and the cost in the Inventory account will be $351 ($85 + $87 + $89 + $90). If the bookstore sells the textbook for $110, its gross profit under perpetual LIFO will be $21 ($110 - $89). Note that this is different than the gross profit of $20 under periodic LIFO. Under the perpetual system the Inventory account is constantly (or perpetually) changing. When a retailer purchases merchandise, the costs are debited to its Inventory account; when the retailer sells the merchandise to its customers the Inventory account is credited and the Cost of Goods Sold account is debited for the cost of the goods sold. Rather than staying dormant as it does with the periodic method, the Inventory account balance under the perpetual average is changing whenever a purchase or sale occurs. Let's assume that after Corner Shelf makes its second purchase, Corner Shelf sells one book. This means the average cost at the time of the sale was $87.50 ([$85 + $87 + $89 + $89] ÷ 4]). Because this is a perpetual average, a journal entry must be made at the time of the sale for $87.50. The $87.50 (the average cost at the time of the sale) is credited to Inventory and is debited to Cost of Goods Sold. 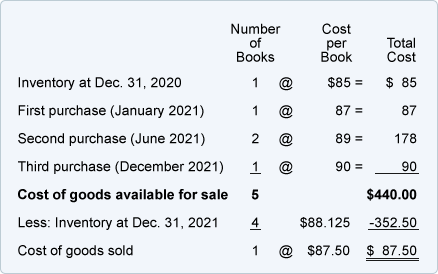 After the sale of one unit, three units remain in inventory and the balance in the Inventory account will be $262.50 (3 books at an average cost of $87.50). After Corner Shelf makes its third purchase, the average cost per unit will change to $88.125 ([$262.50 + $90] ÷ 4). As you can see, the average cost moved from $87.50 to $88.125—this is why the perpetual average method is sometimes referred to as the moving average method. The Inventory balance is $352.50 (4 books with an average cost of $88.125 each). Below is a recap of the varying amounts for the cost of goods sold, gross profit, and ending inventory that were calculated above. The example assumes that costs were continually increasing. The results would be different if costs were decreasing or increasing at a slower rate. Consult with your tax advisor concerning the election of cost flow assumption.